There I was in Starbucks, a block up from Union Square in San Francisco. It was Christmas Day. We had just finished an amazing morning of bringing Christmas to the residents of the tenderloin district. After eating Christmas lunch with some good friends of ours, we were stopping for a coffee. While waiting for our coffee, in walks a homeless man. He approaches me and asks if I have $2 for a coffee. Looking up from updating my facebook account through my iphone, I informed him that I didn’t have any change on me. I asked Steve if he did, and he pulled out his last dollar bill. I went back to my online world and the man went on asking for money from some of the patrons. About 3 minutes later I looked up to notice a Starbucks employee shooing the man out, annoyed that he was there. The man looked me in the eye as he slumped out the door. That look was haunting, but it took awhile for it to sink into my soul. The look crept deeper and deeper inside me, past my iphone-distracted-mind, past my tired bones, and it landed heavily on my heart. The look – desperate, embarrassed, emtpy…lonely. On this Christmas day all he wanted was a cup of coffee. He had looked into my soul – one lone real-life human being alone on Christmas day. Unseen as human. Mistaken as trash, an annoyance, a nuisance. All he wanted was a cup of coffee – just one more dollar. And it was Christmas. I was suddenly distraught. Where had he gone? We get coffee all the time, he could have mine. I interrupted my husband from his iphonic online world and asked him to go grab the guy and buy a coffee for him. At that moment my name was called that my drink was ready. I suddenly didn’t want it anymore but maybe I could give it to the man. I grabbed it, and rushed outside to find him…but he was gone. I looked up and down the street. All I could see were people dressed in their Christmas garb, the sun waning in the winter afternoon sky, and the pigeons flying away. My heart sank. Believe what? The heaviness of the entire day settled upon me, and I felt like I could see past the facade of the city – the irony that 2 blocks away from this gorgeous tourist attraction were the outcasts, the homeless, the forgotten: the tenderloin. As I sat there I could feel the pain, the souls desperate for light, life, an easier path, or maybe just a cup of coffee or even just to be seen as human. To be seen as divine. My coffee grew cold in my hand. I felt like a hypocrite, yet I felt alive and like I could see. It was like the Switchfoot song says – it was a “Beautiful Letdown”…. Steve noticed I was quiet and asked what was wrong. I told him – but how to put into words what I was feeling and sensing. The revelation of it all cascading so fast into the depths of my being, and so sacred that words were hard to try to express. All this man wanted was a cup of coffee on a Christmas Day…and maybe to be seen as an equal with his flesh-and-blood brothers and sisters of the city. And we had been so plugged into our online world, and not present, that we missed being that love for him. A Christmas miracle lost. Believe. It seemed like a mockery at the moment. What about all the people here that do believe and hope and try, only to find nothing in return. And on this Christmas Day there it was, taunting those who had nothing left to believe in. 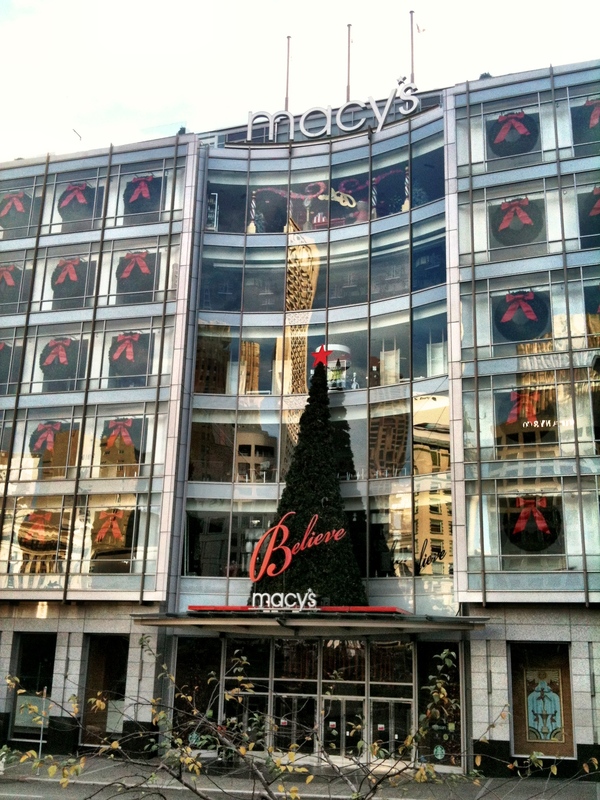 And to make matters worse, I was a bit angry and annoyed that it was on the Macy’s building. How stupid is that? 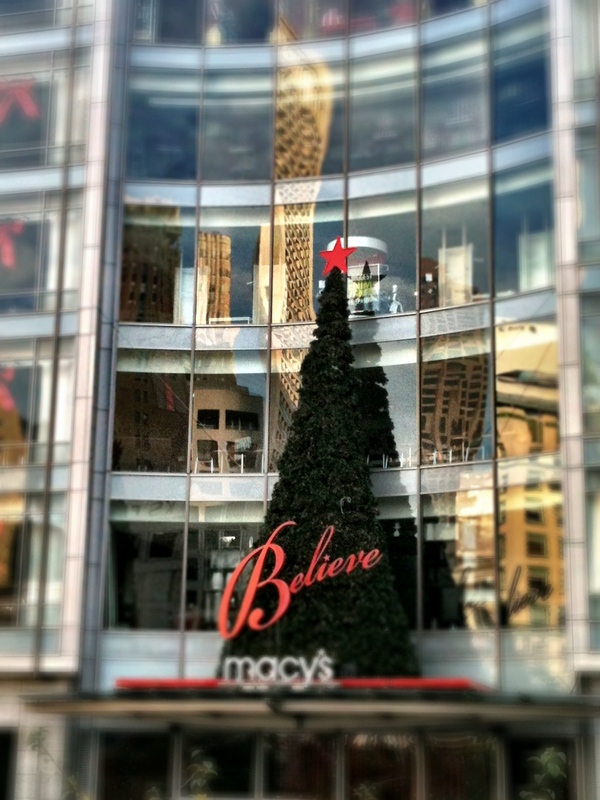 What does “believe” have to do with Macy’s? It seemed like such a dichotomy. “Believe” is such a deep philosophical word and to have it associated with a commercial for mere “stuff” seemed sacrilegious to me. Not to mention all the people who can’t even step foot into that store much less afford it. Believe? Please tell me there is part 2 to this. I’m anxiously waiting to hear the rest! PS. 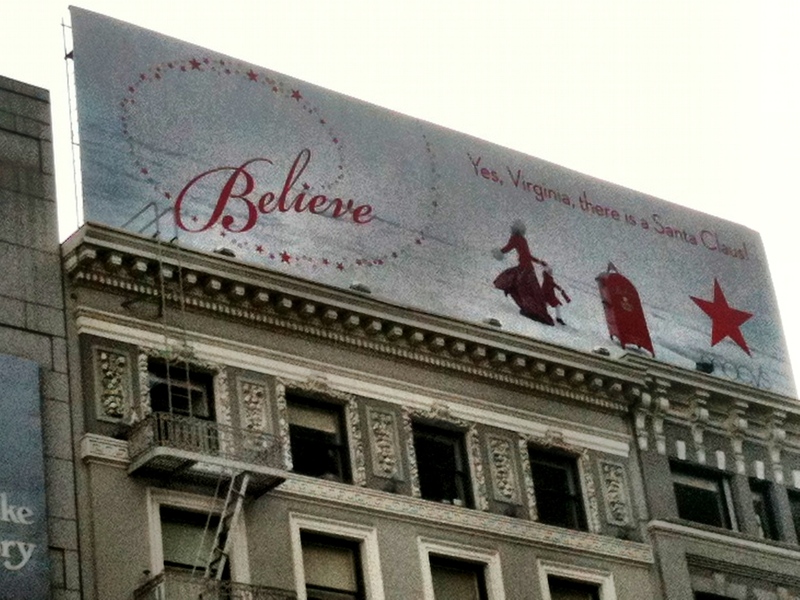 I wonder if the “Believe” sign has anything to do with the “Miracle on 34th st. movie. Macy’s is the sponsor of the Thanksgiving day parade in NY, and everyone ends up “believing” in Santa before the movie is over. Just a thought.